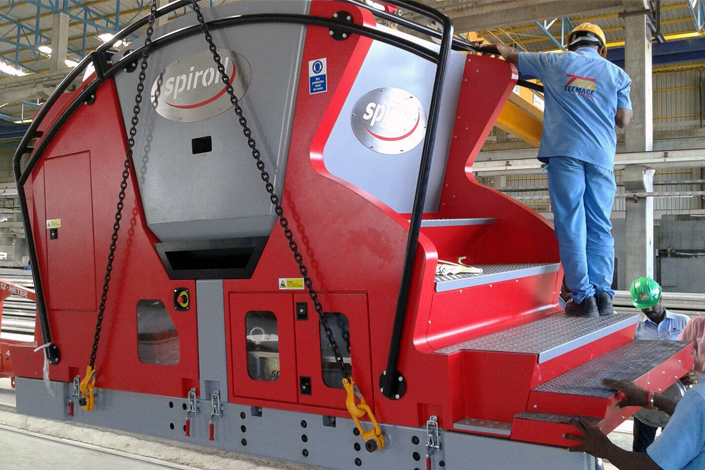 A hollowcore slab manufacturer in India has saved an estimated US $100,000 in raw material costs after investing in the Spiroll Vortex Extruder. Teemage Precast is part of the Chennai Silks Group of companies and supplies precast concrete slabs for a wide range of projects and contractors across India. Having opted for a slipformer machine for its first venture into hollow core slab production at its Tirrupur factory, the company invested in the Vortex to exploit the greater efficiencies provided by a high frequency vibration extruder. Teemage has recently tripled its production capacity, and the purchase of Spiroll machinery has allowed them to fast track set up of a new plant in Delhi. Teemage chose the Vortex Extruder because of Spiroll’s engineering expertise in hollowcore production machinery backed by the global capabilities of parent company CCL, as well as the value for money offered by the machine and the excellent levels of customer service. The raw material savings are the result of two key features of the Vortex Extruder; Dynacore high frequency vibration, facilitating a mix with lower cement content than other machines; and a mandrel drive with static follower tube, which produces Spiroll slabs with highly efficient profiles. India’s precast concrete industry is going from strength to strength and Spiroll looks forward to building on its success with further projects in India in the near future. For more information on the company’s hollowcore production solutions please contact Spiroll.